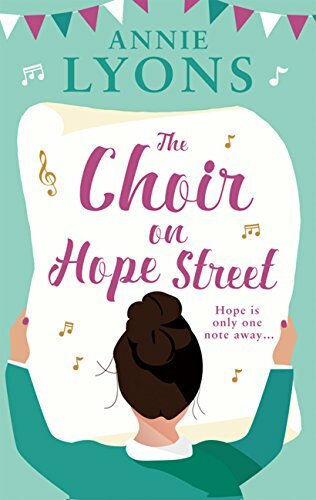 Today I’m very pleased to be sharing a guest post from Annie Lyons, author of The Choir on Hope Street. The book will be published by HQ in paperback and as an e-book on 6th April. At the time of writing the Kindle version is available to pre-order for only £1.99. You can order that by clicking here. Nat’s husband has just said the six words no one wants to hear – ‘I don’t love you any more’. Caroline’s estranged mother has to move into her house turning her perfectly ordered world upside down. This spring, hope is coming! The Choir on Hope Street heroines – are you a Natalie or a Caroline? One of the best (but also let’s be honest, most terrifying) things about being a writer is when your readers give you feedback. It’s a hold-your-breath moment when you find out if what you’ve written is any good. Up until that moment, there’s always an element (or in my case a positive labyrinth) of doubt. I have a couple of friends, who read my books before they’re published. They are the eagle-eyed ones, who will correct last minute errors and they’re also my cultural soul-mates. We like the same books, films and television programmes. We think pineapple on pizza is wrong all wrong and that Sharon Horgan should be put in charge of the world. When I gave them The Choir on Hope Street to read, I was particularly intrigued to know what they would think of my two main characters. ‘Er, thanks?’ I replied, feeling discombobulated. Natalie is a writer like me. She has son who loves Roald Dahl books, like mine. She harbours a worrying addiction to peanut butter. It’s not a crime. Her husband has just told her that he doesn’t love her anymore and she is starting to lose her grip on reality. Cue many worried chats with my husband, who luckily is a kind and often indulgent man. ‘Yes I still love you and no of course you’re not neurotic or chaotic, darling,’ he repeats many times following this feedback. Phew. So that’s all good. This time, I know she’s not talking about me. I am not Caroline, at least not at first glance. Caroline is very organised. I am not. She is always dressed immaculately. Today’s attire: trackie bs and a hoody. She runs a tight ship – always on time, boasting a spotless home. I am always running late and do a nice line in corner cobwebs. I wanted to write a character like Caroline because I’m fascinated by unsympathetic characters and how you get readers to identify with them. At first glance, Caroline could be written off as another tiger mother – a control freak giving off a superior air – always in charge, her life running smoothly. However, I wouldn’t be doing my job if I kept her like that, so I’ve unravelled her tightly bound world. She has to deal not only with her estranged mother coming to live with her for a time but also the reality of her mother’s dementia. Her friendship with Natalie and pivotal role in the choir and community also open her up to a different world view. I wanted her essentially straight-laced and controlled character to remain, whilst bringing to the fore a more humane side with which readers could identify. Caroline may know the Farrow and Ball paint chart off by heart, but she has to deal with the stark reality of her mother’s illness and a number of other emotional bombshells too. They change her and so the reader’s view changes too. I want readers to feel sympathy for her but at the same time, I want them to identify with Caroline and perhaps admit that they have more in common with the character than they first realised. After all, who doesn’t like to be in control of their own little piece of the world? So, as I always try to be honest in my writing, I’ll level with you, reader friend – I am a bit Natalie but I’m also a bit Caroline too – a chaotic control freak, who loves to sing in a choir. Now there’s a character with whom I can identify. I wait with nervous anticipation to hear what you think.